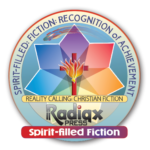 Here are our offerings for vetted Christian science fiction — As always, books can be found in many sections if they are amalgams of multiple genre. 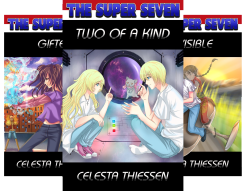 The link for the book or series will take you to the author page and the books are linked from there also. I believe he wrote a very entertaining tale starting from his premise. it surprised me— several times. That is rare at this stage of my life. It did give him a good tale to teach an important truth. I think you’ll enjoy it. 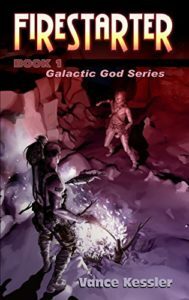 An incredible bit of world & culture building put together with a unique story make this one of the best Christian science fiction series. Here’s the review. “Our story begins with a boy named Roric. Raised sheltered in the countryside he is ill prepared for the event of watching his family die violently, only to then see his entire world crumble as everything he thought he knew is turned to fantasy and he is forced to find himself chained into the life of a slave. A slave struggling to survive in the gladiatorial arena where every match means death for someone, but he survived and one day he escaped. This was his first series. A review is here. 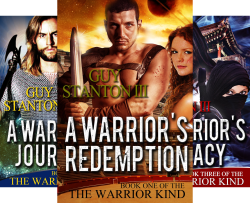 This is epic fantasy on a far planet with much action and spectacular romances. Spectacular western, science fiction a la Louis L’Amour. Of course, there are the intense romance stories also. “My name is Taran Collins. I take pen to paper to let anyone who follows after me a warning. If you come after me you can expect trouble. I don’t know of what kind per se, but……..well let’s just leave it at that. You’ve been warned. 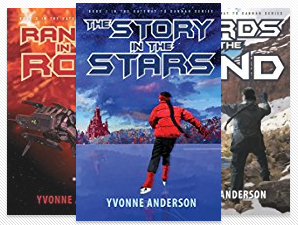 This is a fun mid-school series of seven very short stories: novellas, short stories, tiny novels, whatever you want to call them. 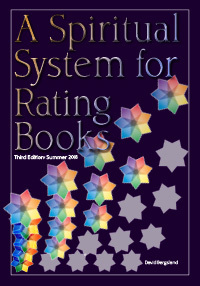 This book is rated G Here’s the review. Science fiction has always been a good way to analyze who we are by having the characters deal with a unique alien culture. 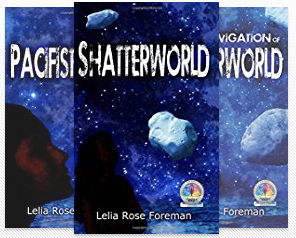 In this book Celesta sends our characters off to deal with aliens who have contacted us to forestall them coming to visit. They might be dangerous. Of course when dealing humans and sin, our corrupting influence is commonly the most dangerous thing imaginable. I don’t know about you, but I tend to forget this. When we look objectively it’s very difficult to avoid being appalled at humans in general. As you can see, the book got me thinking. This is usually good, and God used this book in that manner. So, it was and is a worthwhile read. Twelve-year-old Rejoice cannot stop thinking about space. Her religious colony fled the violence of Earth to a new world to establish an agrarian utopia. The elders have determined that she will become a farmer, no matter what she wants. When she discovers aliens in the ocean and then the doom that is aimed at her planet, Rejoice needs to help her people find a way to survive. Don’t let the enigmatic nature of the covers or the 12 year old heroine in the first book deter you. These are seriously good novels. 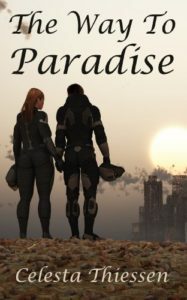 The basic plot is an old one: a group of persecuted Christians escapes Earth and flees to a remote barren, seemingly uninhabited planet. In the first book of the series, Rejoice is a 12 year old genius who saves the planet. In the second, she’s a teenager sharing in a missionary journey around the planet. In the third, she’s married and back to saving the planet again [well, sorta]. The world-building: It is wonderful! This is one of the best planet and colony culture descriptions I’ve read in a while. It’s not geologically or scientifically in depth, yet it’s quite believable for a former scientist, like myself. While it doesn’t match the more comfortable, traditional scifi worlds found in Ben Patterson’s galaxy, it is shared in satisfying depth. It is understandable, the suspension of dis-belief was easy, and the aliens are spectacularly enjoyable. The colony culture is irritating, realistic, and compelling. The alien culture is one of the most detailed alien ways of thinking and interacting I’ve seen in a while. It is immensely fun. This is an excellent science fiction story, ships in space, in trouble. 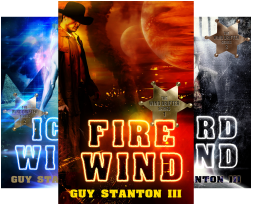 “Two 700-year-old spaceships, a Jesus-follower, and a killer all need help to survive. Nidal is the coder on the Faithful. He’s brilliant, ruthless and faithless. For him, it was join the Brotherhood or watch his mother die. Now, as part of the Brotherhood, he has taken down ship after ship. The flagship, carrying the president, is their last target. A love-starved young woman slips away every night to adventure with dragons, mermaids and even aliens but then she wakes up. In this unusual, Christian sci-fi fantasy novel, Cara Peirce wants to help people. She wants love but making connections in real life just isn’t something she’s good at. Through an unsettling turn of events, Cara finds herself a mostly-willing participant in a bizarre life in which she only feels truly alive in her dreams. Her surreal adventures in other realms seem important, somehow. And, almost every night, she dreams of the same guy – Blaze Saxon. In the end, only whispers remain. But the end is only the beginning.This is the story of a faded dreamer. Actually, the story is closer to science fiction than it is to fantasy. But it’s an excellent story. 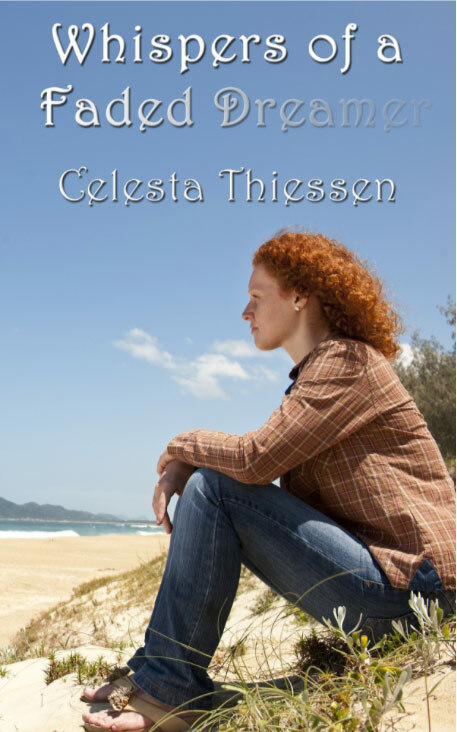 Celesta’s books are always deceptively simple and direct. This book should be one of my worst fears: a lyrical, allegorical fantasy. But she avoids that adeptly. This is one of the most unique books I’ve read in a while. It will take a little effort to wrap your brain around the story. But, once you do, you’ll find it worth the effort. For Philip, a sociology student at N.Y.U., January 25th was supposed to be a normal start to the spring semester. That definitely didn’t happen. As the day unfolded, he came to faith, unknowingly befriended an angel, and was recruited into a covert project to literally build a new world. 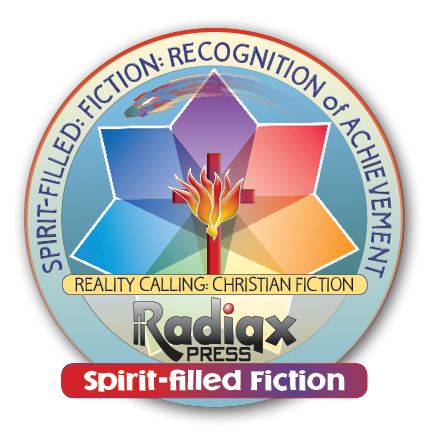 The next two weeks were equally paranormal—yet a lot more trying as Philip’s newfound faith is stretched nearly to the point of nonexistence. The characters are shared in depth. In addition, world-building is expertly done. The story has wonderful twists. And, it’s simply an entertaining tale.